In October, I was featured on Frank Todaro’s Paranormal Internet Radio Show The Invisible World. Recently, people have been dropping me e-mails asking me where they can find it. I looked back through my posts and realized I’d never posted the re-play, so here it is! 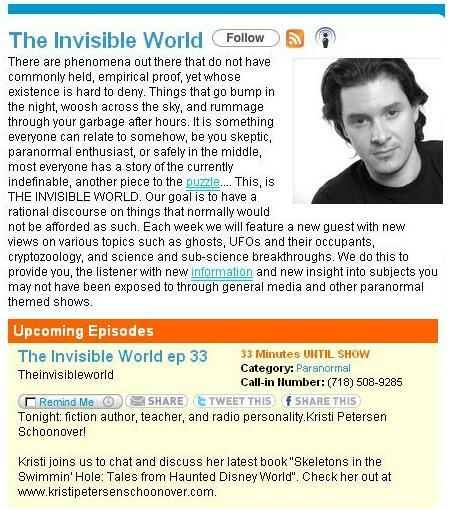 The Invisible World explores paranormal news and features guests discussing all that’s happening in the paranormal—be it UFO sightings, cryptids, ghosts and hauntings, conspiracies, and much more. Frank features guests from all walks: writers, investigators, psychics, and paranormal celebrities. The hour-long show is always entertaining and features psychic Lady Fontaine as well. Support Frank and head on over to The Invisible World at www.blogtalkradio.com/theinvisibleworld and check out Episode 33—you can play it right from his page. Extra bonus? Nathan is featured on Episode 31. Or…you can just click & listen below! Posted on January 26, 2011, in News, Skeletons in the Swimmin' Hole -- Tales from Haunted Disney World and tagged Edgar Allan Poe, Haunted Disney World, Paranormal Radio Shows, Skeletons in the Swimmin' Hole -- Tales from Haunted Disney World, The Invisible World. Bookmark the permalink. Leave a comment.